The raccoon is the animal most likely to contract and spread the rabies virus in the United States. A raccoon rabies epidemic has been spreading steadily since its start on the Eastern Seaboard in the 1950s. The American Veterinary Medical Association estimates that 90 percent of confirmed rabies cases in the United States are found in wildlife, and that raccoons account for close to half of those cases. Pet raccoons are not legal to own in all states. Even where they are, it can be difficult to find a veterinarian who will treat one as a regular patient. 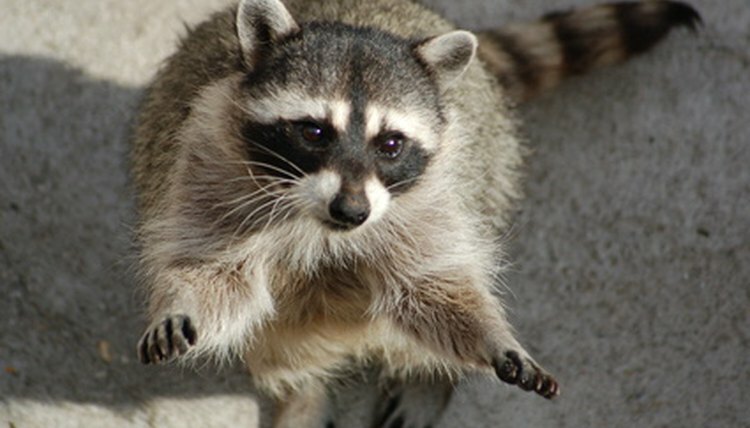 Because raccoons account for a significant percentage of rabies cases in North America, it makes sense to attempt to have your raccoon vaccinated. This could reduce the chances of your pet being infected with the rabies virus, and it might prevent rabies from spreading. Vaccinating your raccoon can also offer your pet a measure of protection in case he later bites or scratches a person or an animal. A raccoon that has been vaccinated for rabies by a veterinarian is less likely to be euthanized for testing after biting. Killed virus rabies vaccines are commonly used on raccoons. As of 2013, two specific brands of rabies vaccines were generally considered acceptable for raccoons by exotic pet veterinarians: Ford Dodge Animal Health's Rabvac-3 or Merial's Imrab-3. No injectable vaccines were officially licensed for use on raccoons by the Federal Food and Drug Administration. Rabies vaccines can be given by injection to your pet raccoon by a willing veterinarian. But you have to understand that the injection might not protect your raccoon completely, and that it could have adverse side effects. Your veterinarian might not want to risk giving your pet a vaccine that is not officially approved for use on raccoons, unless your pet is at high risk for contracting rabies. An oral rabies vaccine is normally used on raccoons because it is more practical to distribute than the injectable vaccine. Merial's Raboral V-RG is the only rabies vaccine the FDA has approved for raccoons. The oral vaccine makes the raccoon's body produce antibodies to fight the rabies virus, according to the North Carolina Department of Health. Distribution of the oral rabies vaccine is restricted. But your veterinarian might be able to get it for your pet, depending on the circumstances and where you live. The antibodies in the oral vaccine protect the raccoon if he is later bitten by a rabid animal. The vaccine will not help an animal who is already rabid. The U.S. Department of Agriculture regularly distributes oral vaccine throughout the eastern United States in hopes of halting the spread of raccoon rabies to the rest of the country. For 2012, oral vaccine capsules were to be contained in bait and distributed throughout rural areas between Ohio and Mobile, Alabama. The oral rabies vaccine has been used in the United States since 1990 and in Canada since 1985, according to the department. As of early 2013, 16 states used oral vaccines to help control rabies in raccoons. Despite the use of oral vaccines, not all raccoons are vaccinated, and the rabies epidemic has continued to grow. Thousands of raccoons are tested for rabies every year in laboratories across the United States. According to the Florida Department of Health, 2,409 of 3,674 confirmed cases of rabies between 1990 and 2009 were in raccoons. The Ohio Department of Health saw 34 confirmed cases between 2006 and 2011, and 199 cases between 1980 and 2009. Centers for Disease Control and Prevention: What Is the Risk for My Pet?